Don't just throw away your old jewelry! At CC's Jewelry in Pearland, Texas, we buy and sell estate jewelry, including gold, silver, platinum, and diamonds. 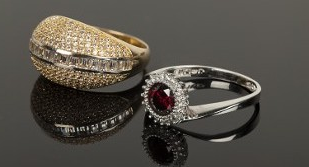 See what your old jewelry is worth, and receive the most money when you sell your jewelry to us. No sale is too large or small; we buy single items or bulk items. Trade-ins are also available. Bring in your old jewelry and leave with a brand new, gorgeous piece to add to your collection. Contact us to get top dollar on your old estate jewelry.